Continuous exposure to many chemicals, including through air, water, food, or other media and products results in health impacts which have been well assessed, however little is known about the total disease burden related to chemicals. This is important to know for overall policy actions and priorities. In this article the known burden related to selected chemicals or their mixtures, main data gaps, and the link to public health policy are reviewed. A systematic review of the literature for global burden of disease estimates from chemicals was conducted. Global disease due to chemicals was estimated using standard methodology of the Global Burden of Disease. In total, 4.9 million deaths (8.3% of total) and 86 million Disability-Adjusted Life Years (DALYs) (5.7% of total) were attributable to environmental exposure and management of selected chemicals in 2004. The largest contributors include indoor smoke from solid fuel use, outdoor air pollution and second-hand smoke, with 2.0, 1.2 and 0.6 million deaths annually. These are followed by occupational particulates, chemicals involved in acute poisonings, and pesticides involved in self-poisonings, with 375,000, 240,000 and 186,000 annual deaths, respectively. The known burden due to chemicals is considerable. This information supports decision-making in programmes having a role to play in reducing human exposure to toxic chemicals. These figures present only a number of chemicals for which data are available, therefore, they are more likely an underestimate of the actual burden. Chemicals with known health effects, such as dioxins, cadmium, mercury or chronic exposure to pesticides could not be included in this article due to incomplete data and information. Effective public health interventions are known to manage chemicals and limit their public health impacts and should be implemented at national and international levels. Chemicals are part of our daily lives. On the other hand, they may cause diseases. Which fraction of the current disease burden do chemicals however cause, and which are the chemicals of greatest concern? This is an important question for decision-makers in order to prioritize efforts to protect us from the harmful effects of chemicals. This article describes and summarizes the main estimates available to date of the health impact of chemicals on the population at global level. It provides their sum and the relative importance of the groups of chemicals contributing to these health impacts. This information on the collective role of chemicals as contributors to global disease may assist policy makers in setting priorities in view of health protection. As the population health impacts from many chemicals have not yet been assessed, an overview of exposures and health impacts is provided to map estimated disease burden to the actual burden and identify data gaps. We also outline the main exposures involved and highlight areas relevant to prevention of exposure. This review has focused on toxic exposures to chemicals which can be significantly reduced or eliminated through environmental and occupational management. These environmental exposures to chemicals cause a disease burden of unknown magnitude, and have yet been attracting considerable attention of the public, policy makers and research communities. This situation has been the main motivation for undertaking this review, and for defining its focus. Chemical exposures that are not primarily linked to environmental management, as for example active smoking, are not addressed in this review. Radioactive substances have equally not been included here, as they have a different mechanism of action, often concern other interest groups and require a specific set of safety measures. Indirect consequences of chemicals, acting for example through climate change, have not been taken into account. Chemicals, whether of natural origin or produced by human activities, are part of our environment. Naturally occurring chemicals include arsenic and fluoride in drinking water, suspended particulate matter and sulfur dioxide from volcanic emission or forest fires, or naturally occurring toxins. Manufactured chemicals include industrial and agricultural products such as pesticides, petroleum products, processed metals, and products of combustion such as toxic gases and particles from industrial emissions and burning of fuel. Some chemicals are manufactured for specific uses, while others are unwanted by-products, wastes, or products of combustion. Their chemical, physical and toxicological properties vary greatly - while many are not hazardous or persistent, some are life-threatening on contact and some persist in the environment, accumulate in the food chain, travel large distances from where they are released, and are harmful to human health in small amounts. 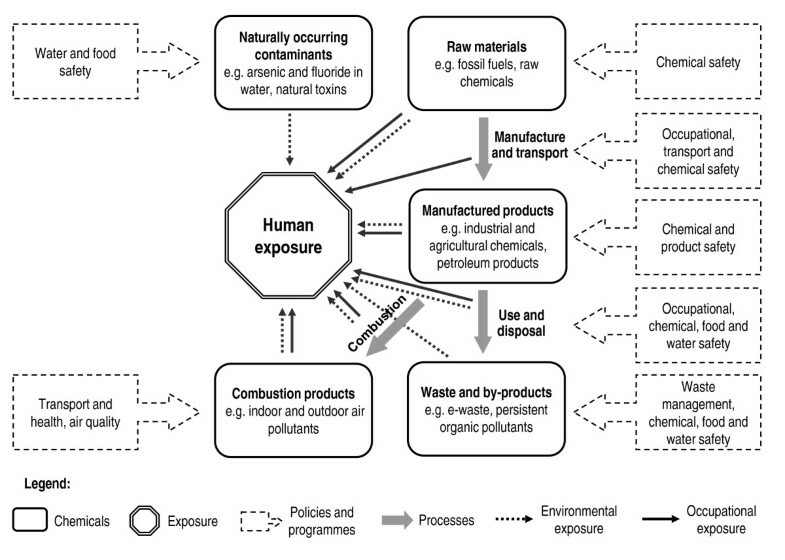 Human exposure can occur at different stages of the life-cycle of a chemical, including through occupational exposure during manufacture, use and disposal, consumer exposure, exposure to contaminated products, or environmental exposure to toxic waste (Figure 1). Exposure can occur via various pathways, including inhalation of contaminated air and dust, ingestion of contaminated water and food, dermal exposure to chemical or contaminated products, or fetal exposure during pregnancy (Table 1). Further information on human exposure to chemicals is available from a variety of documents [1–4]. As illustrated in Figure 1, several sectors and programmes have a role to play in preventing human exposure to chemicals and promoting their sound management throughout their life cycle, including health, environment, agriculture, energy and transport sectors, and water, food and chemical safety programmes. Inhalation of toxic gases and particles from vehicle and industrial emissions, or naturally occurring sources such as volcanic emission or forest fires. Inhalation of pollutants released during indoor combustion of solid fuels, tobacco smoking, or from construction materials and furnishings, contaminants in indoor air and dust. Ingestion of drinking water contaminated with toxic chemicals from industrial effluents, human dwellings, agricultural runoff, oil and mining wastes, or from natural sources. Pesticides, herbicides, fertilisers, metals (copper, lead, mercury, selenium, chromium), arsenic, fluoride, nitrate, cyanide, industrial solvents, petroleum products, disinfection by-products. Consumption of food contaminated with chemicals at toxic levels through agricultural practices, industrial processes, environmental contamination, and natural toxins. Pesticides, methylmercury, lead, cadmium, dioxins, aflatoxin. Lead, mercury, cadmium, phthalates, formaldehyde, dyes, fungicides or pesticides. Ingestion (particularly for children) or inhalation of soil contaminated through industrial processes, agricultural processes or inadequate household and industrial waste management. heavy metals, pesticides, and persistent organic pollutants. Chronic or acute exposures through inhalation, dermal absorption, or secondary ingestion of toxic chemicals or by-products of industrial processes such as agriculture, mining or manufacturing. Pesticides, benzene, heavy metals, solvents, suspended particulate matter. Foetal exposure to toxic chemicals during pregnancy (through placental barrier) or through consumption of contaminated breast milk. Heavy metals, pesticides, benzene, etc. We systematically reviewed the published literature for studies estimating the disease burden, expressed in deaths or DALYs (a measure combining mortality and morbidity), either at global level or covering a large part of the total burden (i.e. national level estimates were generally not retained). We reviewed the disease burden estimates developed by the World Health Organization and those published in the peer reviewed literature. We used combinations of the terms of main chemicals of concern or their mixtures (which might be expected to have broad exposure information and epidemiological evidence, see Additional file 1: Search terms used in Pubmed), "global", "world health", "burden", "impacts", "effects" and "review" in PubMed Databases and Google from 1990 to December 2009. Relevant estimates were found for 14 chemicals or their groups or mixtures. Most estimates were developed by groups of experts coordinated by the World Health Organization. Methods underlying the estimates were reviewed and summarized. For estimating the total known burden of disease from chemicals, methods were reviewed for compatibility, summed up and categorized into broad exposure groups. Estimates from overlapping exposures (i.e. compounds appearing again in mixtures) were removed. In order to map the available estimates of disease burden to the total burden of disease from chemicals we reviewed the literature to develop a basic frame. Table 2 lists the main health outcomes associated with exposure to toxic chemicals to illustrate this wide range of diseases. Second-hand smoke; occupational exposures to cleaning-agents, pesticides, hairdressing chemicals etc. Occupational exposures to carcinogens, aflatoxins in food, second-hand smoke, outdoor air pollution by carbon particles associated with polycyclic aromatic hydrocarbons, asbestos, arsenic; volatile organic compounds such as benzene, pesticides, dioxins. etc. Lead, methylmercury, polychlorinated biphenyls (PCBs), arsenic, toluene etc. Arsenic, N-3-pyridylmethyl-N'-p-nitrophenyl urea (rodenticide), 2,3,7,8-Tetrachlorodibenzo-p-dioxin. In most disease burden estimates for risk factors, the basic method can be summarized in the following steps: (a) estimating the exposure distribution in a population; (b) selecting one or more appropriate relative risk estimates from the literature, generally from a recent meta-analysis; and (c) estimating the population attributable fraction (simplified formula in Panel 1 [5, 6]). The resulting population attributable fractions, estimated for each disease, age group, gender, and population group, are then multiplied by the total number of deaths and disability-adjusted life years (DALYs) for the disease in each population group. DALYs are a weighted measure of deaths and disability . The method systematically assesses changes in population health by varying distribution of exposure using a unified framework linked to the Global Burden of Disease ; Developed by WHO and numerous experts,  this study included risk factors causing more than 0.5% of the global disease burden, with high likelihood of causality, and reasonably complete exposure data. CRA approaches involve estimating the disease burden compared to a "counterfactual" exposure distribution which will generally lead to the lowest conceivable disease burden, irrespective of whether currently attainable in practice . For example, the counterfactual exposure for outdoor air pollution was the natural background level of particulate matter, and zero for second-hand smoke. The disease burden estimates essentially represent the burden that could be prevented if the risk factors were removed. Additional details of the methods are provided in greater detail in the original publications [8–10]. Limitations of the CRA approach include (a) the limited scope by addressing only risk factors with large impacts at global level; (b) the restriction to high level of evidence, not taking account of "likely" impacts (which can also be seen as an advantage) and therefore generally underestimating the total impacts; (c) the inclusion of only those diseases defined through the International Classification of Diseases (ICD), rather than all health effects. For example loss of IQ points from lead (unless resulting in mental retardation) has not been taken into account, as it is not a disease according to ICD. Some estimates use methods similar to the CRA but not necessarily a unified framework [11, 12]. This means that the choice of outcomes and exposure-risk relationships does not necessarily underlie specific selection criteria, and that different approaches are used in terms of counterfactual scenarios (i.e. alternative exposure scenario). Such assessments may be equally rigorous as compared to the CRA, but results may not be comparable or additive with CRA estimates. These methods combine CRA estimates and evidence synthesis from partial or geographically limited assessments, and fill knowledge gaps with expert estimates. This approach may provide approximate estimates when global exposure information is limited, or when quantitative exposure-risk relationships are supported by weaker evidence. Rigorous estimates can so be completed to obtain a fuller picture of likely population health impacts from various risks. The main disadvantage obviously consists in the lower level of evidence supporting those estimates. Further details on the method are provided in the original publication . Before adding up the estimated burden of disease from various chemicals, any joint effects of different risks need to be considered. The burden of disease estimates describe the burden that would be removed if exposure was reduced to the counterfactual exposure . As diseases may be caused by multiple factors, the estimated disease burdens could add up to more than 100%. For example, one childhood deaths of respiratory infection of an underweight child could be prevented both by removing the source of indoor air pollution, or by improved nutrition . Deaths from those two risk factors should therefore not be added up. In the case of the chemicals identified in this article, however, significant overestimation of the burden due to joint effects is unlikely: few exposures are expected to overlap significantly and at the same time cause synergistic effects or health impacts that could be avoided by reducing either of those exposures. For greater consistency with previous estimates and better comparability and additivity, we preferred CRA types of assessments and others using a counterfactual exposure. The systematic literature review revealed burden of disease estimates for the following chemicals or groups of chemicals: (a) chemicals involved in unintentional acute poisonings, (b) chemicals involved in unintentional occupational poisonings, (c) pesticides involved in self-inflicted injuries, (d) asbestos, (e) occupational lung carcinogens, (f) occupational leukaemogens, (g) occupational particulates, (h) outdoor air pollutants, (i) indoor air pollutants from solid fuel combustion, (j) second-hand smoke, (k) lead, and (l) arsenic in drinking water. The following paragraphs describe and discuss available estimates for these chemicals. An overview of the global burden of disease attributable to these chemicals is presented in Table 3. More detailed descriptions of the methods used for the presented burden of disease estimates are found in the original referenced publications. Most of the identified burden of disease estimates from chemicals follow CRA methods and provide data for the year 2004 , which was used as the reference year in this article. Limited to preventable self inflicted injuries. Impact of accidental and chronic exposures not considered. Only urban air pollution in cities with >100 000 inhabitants taken into account. Health impact from rural air pollution unknown. Disease burden from emissions from building materials and household products is not know. BoD from second hand smoke has been evaluated separately. Limited to exposure through drinking water. Limited to Bangladesh. ‡ DALYs are "Disability-adjusted life years", a weighted measure of years of life lost due to premature death, and years lived with disability. ¤ Only outcomes qualified as strong evidence were considered. § Methods: A: Comparative Risk Assessment (CRA); B: Based on exposure and exposure-response (similar to CRA); C: Evidence synthesis and expert evaluation. # The estimates were developed within three years and their pooling is unlikely to introduce a significant error. NA: not available. -: none. a Estimate not compared to counterfactual exposure, which is however estimated to be negligible using a theoretical minimum exposure given available management options for concerned chemicals. b Values updated for 2004 based on original reference. c Already included in total unintentional acute poisonings and therefore not included again in the total. d Lung cancer and asbestosis caused by asbestos are also considered in occupational lung carcinogens and particulates and this part of the burden is therefore not counted twice in the total. e Also includes a small fraction of leukaemia caused by ionizing radiation. g Overlaps with the burden from outdoor air pollution and is therefore not included in the total. h Total is corrected for double counting (chemicals considered in more than one estimate); not all disease burdens are however additive, and joint exposures could lead to slight overestimate (see Methods section). Unintentional ingestion, inhalation or contact with chemicals caused 346,000 deaths (7,447,000 DALYs) from acute poisonings in 2004. About 71% of unintentional poisonings were estimated to be preventable through improved chemical safety , amounting to 240,000 deaths and 5,246,000 DALYs in 2004. The share of this disease burden affecting children amounts to 19%, and 30,000 deaths were estimated to occur at the workplace. Chemicals responsible for unintentional poisonings may include methanol, diethylene glycol, kerosene, pesticides, and many others. Original methods for occupational poisonings were developed in the CRA framework . This estimate also includes inadequate use of pharmaceuticals, which is however likely to be a minor contributor. A large body of evidence supports the causation of various diseases (e.g. cancers, birth defects) and other health effects (e.g. endocrine disruption, neurotoxicity, kidney/liver damage) by exposure to pesticides . Both exposure and exposure-response data available are unfortunately too limited to estimate the global health impacts of pesticides. The global impact of self-poisoning (suicides attempts) from preventable pesticide ingestion was, however, estimated to amount to 186,000 deaths and 4,420,000 DALYs in 2002 (analysis of evidence complemented by expert opinion ). The total burden of suicides from pesticide ingestion was estimated to amount to 258,000 deaths in 2002 with a more rigorous approach, but the former estimate is used in this context for methodological reasons (includes a counterfactual approach, to allow for additivity of results) . Current evidence supports that suicide rates could be significantly reduced through limiting access to lethal means, among other methods [17, 18]. About 30% of self-inflicted injuries globally involve pesticides, and occur mainly in Asia and to a lesser extent in almost all other parts of the world. Exposure to asbestos causes lung cancer, mesothelioma and asbestosis (fibrosis of the lungs), and other outcomes . The global burden of disease attributable to asbestos has been estimated to amount to 107,000 deaths and 1,523,000 DALYs for the three mentioned diseases in 2004. Among these, 41,000 deaths and 370,000 DALYs were due to asbestos-caused lung cancer, and 7,000 deaths and 380,000 DALYs to asbestosis. The remaining 59,000 deaths and 773,000 DALYs were attributed to malignant mesothelioma [14, 15, 20]. Deaths and DALYs from lung cancer and asbestosis are also included in the estimates for occupational lung carcinogens and occupational particulates, and are therefore not counted twice when summing the total disease burden from chemicals in Table 3. Occupational exposure to arsenic, asbestos, beryllium, cadmium, chromium, diesel exhaust, nickel and silica were estimated to cause 111,000 deaths (and 1,011,000 DALYs) from lung cancer in 2004 . This represents about 9% of the total burden of lung cancer. Health impacts from additional lung carcinogens, such as bis(chloromethyl)ether, 2,3,7,8-TCDD, soot exposure while chimney sweeping, aluminium production, iron and steel founding, rubber manufacturing among others could not be estimated . Benzene, ethylene oxide and ionizing radiation were the only occupational leukaemogens considered in the estimation of global burden of disease from occupational leukaemogens . This analysis resulted in a total of 7,400 deaths (and 113,000 DALYs) in 2004 , representing 2.3% of the total burden of leukaemia. IARC has classified few additional chemicals or exposures as supported by sufficient evidence in their association with leukaemia, including formaldehyde and exposures in the rubber manufacturing industry . Exposure to particulate matter has been linked to a vast range of respiratory and other diseases. The estimation of disease burden from occupational exposure to particulate matter was limited to selected respiratory diseases as exposure and risk information at global level is limited . Effects from exposure to dust and/or gas/fumes on COPD, and from exposure to silica, asbestos and coal mine dust on silicosis, asbestosis and coal workers' pneumoconiosis were considered. The estimated health impacts were 375,000 deaths and 3,804,000 DALYs from COPD, and 29,000 deaths and 1,061,000 DALYs from asbestosis, silicosis and pneumoconiosis in 2004 [14, 20]. Occupational agents associated with the development of COPD include for example mineral fumes, welding fumes, cadmium fumes and sulfur dioxide . The fraction of COPD attributable to occupational particulates is estimated to amount to 13% globally. Some dusts of biological nature, such as cotton, grain and wood dusts, are also suspected to have a role in COPD causation . Despite the possible inclusion of biological dusts, this estimate may still be an underestimate as only part of the respiratory diseases caused by chemicals were considered. Outdoor air pollution contains particulate matter and gaseous pollutants, such as sulfur dioxide (SO2), nitrogen oxides (NOx) and carbon monoxide (CO), as well as secondary pollutants such as ozone (O3) formed from directly emitted pollutants. Further constituents of the pollutant mixture include carcinogens such as benzo[a]pyrene, benzene and 1,3-butadiene . Health impacts from urban air pollution, largely from combustion sources, caused overall about 1,152,000 deaths (8,747,000 DALYs) worldwide in 2004 [14, 24]. In particular, respiratory infections in children contributed 121,000 deaths (1,555,000 DALYs) to this burden, lung cancer 108,000 deaths (931,000 DALYs) and other cardiopulmonary illnesses 923,000 deaths (6,261,000 DALYs). About 10% of this burden is estimated to affect children. Exposure was measured, and modeled when not available, using particulate matter (PM10 and PM2.5) as an index for common mixtures of urban air pollution . These estimates cover cities with >100,000 inhabitants. Rural outdoor air pollution, e.g. caused by forest fires  or indoor combustion of solid fuels, may also contribute to global health impacts and have not been estimated. Indoor air pollution is caused by both traditional sources of pollution, primarily by the combustion of solid fuels for cooking or heating, and modern sources such as building materials and household products emitting chemicals. Household combustion of coal or biomass produces smoke that contains carbon monoxide (CO), nitrogen oxides (NOx), sulfur oxides (SOx), benzene, formaldehyde, polyaromatic compounds, and particulates and many more . Building materials and household products can release toxic chemicals such as benzene and formaldehyde. About half of the world's households still use solid fuels, which were estimated to cause 872,000 deaths (30,854,000 DALYs) from lower respiratory infections in children, 36,000 deaths (338,000 DALYs) from lung cancer, and 1,057,000 deaths (9,817,000 DALYs) from COPD in 2004 . With 75%, children bear the greatest burden from exposure to these pollutants. This estimate only covered indoor smoke from solid fuel combustion, and did not address emissions from building materials and household products, such as benzene and formaldehyde, and other indoor air contaminants. Second-hand smoke is a complex mixture of compounds emanating from tobacco smoke causing indoor air pollution. These include more than 30 known or suspected human carcinogens, such as 4-aminobiphenyl, 2-aminonaphthalene, benzene, nickel, and a variety of polycyclic aromatic hydrocarbons (PAHs) and N-nitrosamines . A number of irritants, such as ammonia, nitrogen oxides, sulfur dioxide and various aldehydes, and cardiovascular toxicants, such as carbon monoxide, nicotine and some PAHs, are also present . Second-hand smoke was estimated to cause 166,000 deaths (6,616,000 DALYs) in children in 2004, and 436,000 deaths (4,297,000 DALYs) in non-smoking adults , which means that 61% of the burden is borne by children. Human exposure to lead contributes mainly to cardiovascular diseases, mild mental retardation from childhood exposure leading to reduced intellectual function, and additional outcomes which are more difficult to quantify . The 2004 global burden of disease for these outcomes was estimated to be 143,000 deaths and 8,977,000 DALYs . Among those, all deaths and 1,789,000 DALYs were due to lead-induced cardiovascular diseases in adults, and 7,189,000 DALYs were a result of mild mental retardation due to lead-associated IQ deficits, which means that children carried 80% of the disease burden from lead. Childhood lead exposure was estimated to contribute to about 600,000 new cases of children with intellectual disabilities every year. Between 2000  and 2004, the proportion of the global population with blood lead levels above 10 ug/dl decreased from 20% to 14%, and resulted in similar reductions in the disease burden, mainly due to important efforts in phasing out leaded gasoline in most countries. It should be noted that blood lead levels can cause disease well below 10 ug/dl. Other significant sources of lead exposure however persist and continue to contribute significantly to the overall disease burden [32, 33]. Additional confirmed or suspected outcomes (see Table 2) or health impacts from "hot spots" (e.g. locally elevated exposures from industrial activities) were not included in the estimate. Human exposure to arsenic can cause a variety of health effects and diseases, including cancer of the skin, bladder, kidney and lungs. Other effects of long-term exposure are peripheral neuropathy, gastrointestinal symptoms, diabetes, reproductive effects, enlarged liver, bone marrow depression, destruction of erythrocytes, high blood pressure and cardiovascular disease [34–36]. Exposure to arsenic can occur through different environmental pathways, including from mining and smelting activities, burning of arsenic-rich coal and ingestion of contaminated drinking-water. Arsenic mainly enters drinking-water supplies through natural deposits in the soil, but also through industrial and agricultural activities (including discharge of industrial wastes, burning of fossil fuels - especially coal - and wastes, or use of pesticides and food additives). The health impacts of exposure to arsenic in drinking water have been estimated for Bangladesh . Another estimate has been performed at global level, but is not comparable . Arsenic-contaminated drinking-water in Bangladesh alone contributed 9,100 deaths and 125,000 DALYs in 2001 from diabetes mellitus, ischaemic heart disease, lung cancer, and bladder, kidney and skin cancer . About two thirds of the total population exposed to elevated drinking-water levels are estimated to reside in Bangladesh . The estimated burden of disease therefore represents a significant part of the global burden from arsenic in drinking water. A global estimate, or an estimate for other exposures than drinking water was not available for arsenic. Additional assessments of global health impacts of selected chemicals have been made but results are not comparable to the other analyses compiled here, either because they were not expressed in DALYs and deaths, or because DALYs have not been estimated in a comparable format. Examples include fluoride and mercury. They are presented in the following paragraphs. Insufficient fluoride intake increases the risk to develop dental caries, while excessive intake can lead to dental and skeletal fluorosis. High concentrations of fluoride can enter public water systems from natural sources, including runoff from the weathering of fluoride-containing rocks and soils and leaching from soil into groundwater. Fluoride pollution from various industrial emissions can also contaminate water supplies . Excessive fluoride concentrations in drinking water was estimated to have caused about 47 million of dental fluorosis cases and 20 million skeletal fluorosis cases in 17 countries (in terms of prevalence, based on point estimates published between 1953 and 2000) . Mercury compounds are toxic to the nervous, digestive, cardiovascular and immune systems, to the lungs, kidneys, skin, eyes, and gastrointestinal tract, and adversely impact on development [40, 41]. Mercury releases in the environment result mainly from human activity, for example emissions from coal-fired power plant, and the use of mercury-containing products. Once in the environment, elemental mercury is naturally transformed into methylmercury that bioaccumulates in fish and shellfish. Human exposure occurs mainly through inhalation of elemental mercury vapors during industrial processes and through consumption of contaminated fish and shellfish. Transplacental exposure of the foetus may also occur . The analysis of disease burden from methylmercury was limited to cognitive impacts and mild mental retardation. It was estimated that, among selected subsistence fishing populations, between 1.5/1000 and 17/1000 children showed cognitive impacts caused by the consumption of fish containing methylmercury. These results are however not comparable to estimates of deaths and DALYs [41, 43]. Exposures used in the burden of disease estimates have included (a) international databases or systematic reviews of monitoring/modelling of environmental levels, such as for outdoor air pollution [44, 45] and arsenic [11, 37] (b) international databases or systematic reviews of survey data, such as for indoor air pollution  and second-hand smoke  (c) systematic reviews of bio-monitoring data, such as blood lead levels [31, 47], or (d) international databases or systematic reviews of occupational exposures by sector or occupational category, such as for occupational carcinogens  or occupational particulates . These exposure data have been combined with exposure-risk information from major reviews or epidemiological studies to result in burden of disease estimates. Examples include lead and hypertension or cardiovascular effects [49, 50]; lead and children's intellectual function [51, 52]; outdoor air pollution and cardiopulmonary disease ; second-hand smoke and related outcomes [27, 28, 54]; arsenic in drinking-water and related outcomes ; occupational exposure and lung cancer  or asbestos ). The estimation of acute effects from chemicals at population level has generally been based on the direct assessment of cases or deaths, such as mortality statistics for unintentional poisonings  and systematic reviews of vital statistics, autopsy reports, surveillance systems, hospital-based studies etc. for suicides involving pesticides . This review shows that, based on estimations available to date, the global burden of disease attributable to environmental exposure and management of selected chemicals amounts to at least 4.9 million deaths (86 million DALYs) per year. This represents 8.3% of the total deaths and 5.7% of the total burden of disease in DALYs worldwide. For comparison, this is more than the burden of all cancers worldwide, which account for 5.1% of all DALYs . Fifty-four percent of this burden (counted in DALYs) is borne by children under the age of 15 years. The share of the total disease burden is considerable, and supports the need for further public health considerations in this area. By far the largest disease burden is related to exposure to air pollution mixtures with 70% of the total (Figure 2). Our estimate includes available information for chemicals in a broad sense, i.e. not only industrial and agricultural chemicals but also air pollutants and some naturally occurring chemicals. Available information for industrial and agricultural chemicals and acute poisonings only (i.e. without air pollution nor arsenic-contaminated drinking-water) amounts to a global burden of disease of at least 1.2 million deaths (25 million DALYs), corresponding to 2.0% of the total deaths and 1.7% of the total burden of disease worldwide. The global estimates presented in this article undoubtedly underestimate the real burden attributable to chemicals. Comparing the identified disease burden from chemicals with the health effects listed in Table 2 shows that only limited relevant exposures and some of the health impacts they cause have so far been quantified at population level. There are several reasons for this underestimate: (a) Quantified exposure-response relationships, supported by strong evidence, between many chemicals and their health outcomes are lacking. Establishing further links between certain chemicals and their health hazards would be useful but may be complex; (b) Large-scale exposure data are insufficient. Even chemicals with health consequences supported by strong evidence of causality therefore bear considerable knowledge gaps in terms of population impact; (c) This analysis also failed to capture much of the health impacts from exposure to polluted sites which are estimated to put at risk more than 56 million people worldwide ; such locally-specific health impacts are difficult to estimate with available methods and should be considered separately. As this review is mostly built on previous estimates developed by WHO - given the limited availability of other estimates - the use of rigorous methods further contributes to restricting the estimates to only those supported by strong evidence and to ICD disease categories rather than including all health outcomes. Development of additional estimates would contribute to obtaining a fuller picture of the population health impacts from chemicals. This review is also limited in its scope: Not all chemicals have been reviewed here, but only toxic exposures to chemicals which can be significantly reduced or eliminated through environmental and occupational management as described in the background section. Therefore lifestyle issues, such as active smoking or other substance abuse, have not been taken into account here. The same applies to chemicals acting on health through radiation rather than their toxic properties. Significant examples of chemicals with yet unknown burden of disease include: a) chronic exposure to toxic pesticides; b) exposure to mercury c) exposure to cadmium, d) exposure to additional occupational carcinogens. It is, unfortunately, not possible to conduct estimates based on the different modes of action by which chemicals exert their toxic effects, such as through endocrine, immune or other systems. While certain outcomes, such as those resulting from acute poisonings or high-level exposures, may easily be traced back to chemicals, other delayed or sub-clinical health effects such as cancers or certain neurological diseases are much more difficult to allocate to specific exposures (Figure 3). This is particularly true for diseases with long lag-times from exposures, complex exposure assessment, and often non-specific health outcomes. Also current toxicological test systems have limitations in their ability to predict effects in humans. 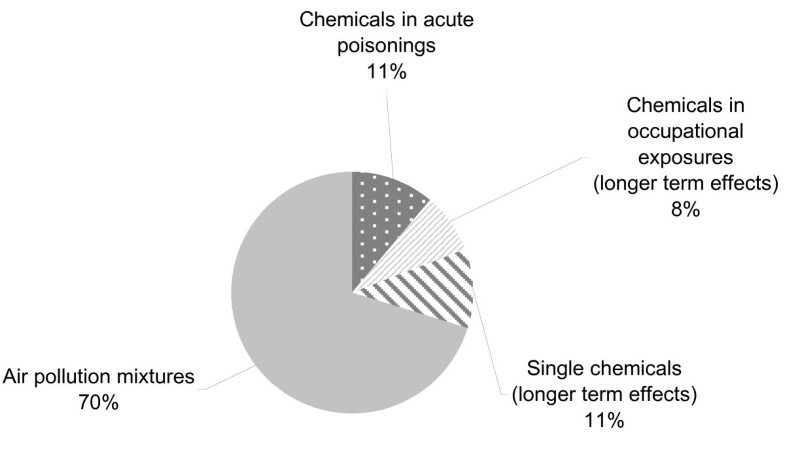 Figure 2 schematically represents the possible fraction of the true burden of disease from chemical exposure that has effectively been traced back with sufficient scientific evidence to chemicals. It highlights that acute poisonings, outcomes caused by high-level exposures and rare health effects in more controlled occupational environments are often easier to trace back to chemicals than health effects resulting from the more frequent but lower-level exposures. Uncertainty estimates were rarely available for the identified burden of disease estimates, and even if they were, they mostly relied on expert opinion or variation of selected input parameters rather than more systematic assessments. This was due to difficulties in the evaluation of the numerous uncertainties inherent to burden of disease estimates, which stem from exposure and exposure-response relationships, their extrapolation from one population to another or other parameter or model uncertainties. Sources of uncertainties were different for each of the assessed risk factors, and additional information on their specific sources can be found in the original publications (see references in Table 3). The estimated disease burden does not show the important beneficial effects of long-term regulation of chemicals in food, consumer and other chemical products, industrial emissions and workers' protection which have already prevented a significant fraction of the disease burden that would have occurred had these controls not been in place. This is due to the fact that the burden of disease estimates represent a "snapshot" for about the year 2004, and limited information on trends. For example, in 2003, the European Commission forecast the health benefits of its REACH legislation to be 50 billion Euros over 30 years . To improve exposure information, bio-monitoring initiatives are developing, and should continue improving large-scale exposure information [61, 62]. New strategies and initiatives have been implemented which might change the picture of chemical exposure and risk assessment and could improve estimation of disease burden caused by chemicals (e.g. the REACH programme , the High Throughput Screening Initiative ). In addition, alternative, innovative methods may be required to estimate the full health impacts involving chemicals at population level, using for example a combination of disease trends, exposure patterns, biomarkers, and an improved understanding of the human relevance of effects seen in chemical testing systems. In 2002 at the World Summit on Sustainable Development (WSSD), governments renewed their commitment to the sound management of chemicals throughout their life cycle and of hazardous wastes. Governments aim to assure, by 2020, that chemicals are used and produced in ways that lead to the minimization of significant adverse effects on human health and the environment, using transparent science-based risk assessment procedures and science-based risk management procedures. The burden of disease information presented here shows that this goal has not been reached, and the limited available trend information indicates that renewed efforts will be required over the next decade to 2020. This is despite the knowledge that has long existed about the adverse health impacts of lead, mercury, asbestos and the other chemicals considered in this paper. While the estimation of the burden of disease attributable to air pollution and naturally occurring chemicals has involved exposure and risks assessments by health or environment authorities, managing these exposures and reducing risk often requires action by other sectors and stakeholders, including regulatory bodies, industry and civil society. These actors are often different than those responsible for the sound management of agricultural and industrial chemicals. For example, health impacts and exposure to air pollution can primarily be modified through action in the energy and transport sectors and the industry, while arsenic in drinking-water is managed through the water sector. Other exposures involve chemicals only as a side-product of energy generation or of tobacco consumption, such as the main contributions to outdoor and indoor air pollution. Reducing human exposure to air pollutants and naturally occurring chemicals therefore requires efforts from a wide range of stakeholders, including industry and civil society. Our review indicates that public health can be improved substantially, and in some cases relatively quickly, by identifying and implementing further effective interventions on chemicals of major public health concern including those addressed in this article. It is particularly urgent to address those chemical such lead and asbestos for which evidence, exposure and policy options have been known for quite some time, international agreements are in place, but exposure and effects are still significant in several populations. In addition governments can improve public health by collecting information to identify the additional hazardous chemicals to which their populations are exposed in order to take action on the most important problems. Finally, research aiming to improve our understanding of the link between chemicals and negative health impacts is imperative in order to prioritize actions and assess their effectiveness. This review shows that the currently known disease burden from chemicals is large, and that the yet unknown burden may be considerable. 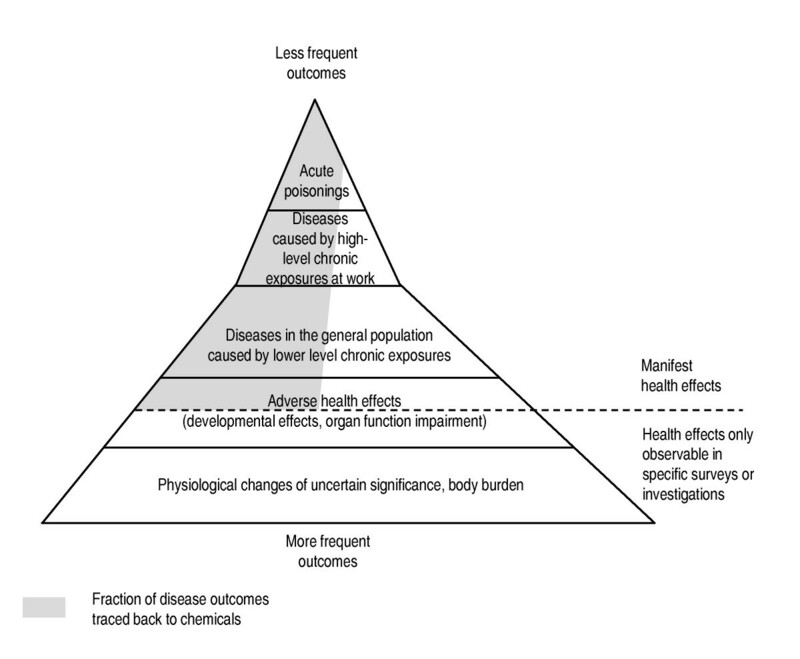 Although underestimated, the global burden of disease attributable to chemicals is useful information for international, regional and national decision-makers from the different sectors and programmes who have a role to play in reducing human exposure to toxic chemicals (Figure 1). This review supports that further attention should focus on investigating population health impacts from chemicals, and on the preventive measures limiting harmful exposures to chemicals. The estimated burden of disease from chemicals and its preventable fraction provides an indication of how much disease burden could be prevented through targeted action, and will facilitate the evaluation and monitoring of these actions in the future. For example the proportion of people with blood lead levels above 10 ug/dl globally decreased from 20% to 14%, alongside similar reductions in the disease burden it caused. This reduction is due mostly to the phase out of leaded gasoline in most countries, providing a powerful example of the impact risk management can have in a relatively short time. The authors thank Dr Gretchen Stevens and the peer reviewers for the useful comments they provided. The authors alone are responsible for the views expressed in this publication, which do not necessarily reflect the decisions or the stated policy of WHO or of its Member States. All authors read and approved the final manuscript. APU reviewed the literature, synthesized the data and drafted the main part of the manuscript. PH provided input to the drafting process. CV drafted the section 'link to policy initiatives' and reviewed the draft. Roberto Bertollini provided overall guidance and reviewed the draft. All authors read and approved the final manuscript. This article is published under license to BioMed Central Ltd. This is an Open Access article in the spirit of the BioMed Central Open Access Charter http://www.biomedcentral.com/info/about/charter/, without any waiver of WHO's privileges and immunities under international law, convention or agreement. This article should not be reproduced for use in association with the promotion of commercial products, services or legal entity. There should be no suggestion that WHO endorses any specific organisation or products. The use of the WHO logo is not permitted. This notice should be preserved along with the article's original URL.